For more information on choosing your perfect log cabin, read our 'Ultimate guide to buying a log cabin' today. Relax in style in one of our fantastic garden log cabins. These log studios are perfect for those looking for a smart and efficient way to add that extra bit of space to the home, without requiring extra planning permission for building extensions. Our log cabins come in multiple shapes, sizes and styles, so there is sure to be the perfect option for your garden or outdoor area. Choose from a more traditional style or a contemporary wooden building. 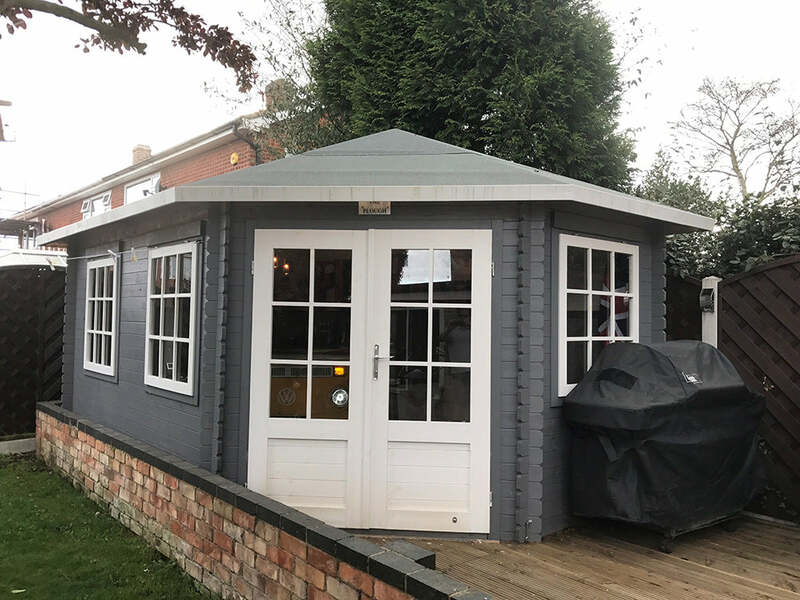 Apex roofs and sash windows offer a classic cabin look, whilst flat roofs with glazed windows offer a modern contemporary addition to your garden. We can even assemble your log cabin for you for just a small additional charge, or you can choose the DIY option and assemble your new cabin yourself. Corner log cabins are the perfect option for those looking to tuck a little cabin away in the corner of a garden. The perfect space to work, to craft or to sit and relax. All log studios and sheds from Waltons are made from the highest quality FSC certified sustainable timber. Slow grown pine timber ensures that the build of the cabins is extremely dense and durable, helping to create value for money through long-lasting quality workmanship. The tongue and groove timber interlock, giving the walls, floors and roof an extremely strong rigidity. Log cabins are popular with the self employed and small business owners as they can be used as a home office. This helps to keep down operation costs and additional office rent, providing you with a distinct workspace to separate home and work life. Browse our range of log home offices, as some feature multiple rooms which are ideal for meeting space. It isn't all work, however! These wooden buildings are also perfect for garden entertainment and can be used when hosting garden parties to shelter from the unpredictable British weather! Keep safe from summer showers and heavy rain, before heading back outside when the sun is shining. There will be some construction required when you receive your log cabin so do check our guides. Alternatively, if you'd rather not build your own from a garden log cabin kit, then our team can assemble it for you on delivery. Give us a call to find out what your options are.